It was a loud ovation at the 13th matriculation ceremony of Tai Solarin University of Education, Ijagun, Ogun State as a 200 level French Department student, Miss Oluiwakemi Iwamigha was offered scholarship by the National Alumni Association of the Institution. Iwamigha, who has superlative CGPA of 4.95 in the 2016/2017 academic session was presented with the award at the ceremony by the Acting Vice Chancellor of the University, Prof. Abayomi Arigbabu and was equally commended for her exemplary academic performance, with a promise that the University is poised to assist other brilliant students. The Vice Chancellor, who was speaking at the 2017/2018 matriculation ceremony, however, admonished the newly admitted students to emulate Iwamigha’s outstanding academic prowess as he noted that dedication, determination and perseverance can lead them to academic excellence. Prof. Arigbabu further advised the students to desist from activities that are inimical to their stay on campus. “You are advised in your own interest to shun attitudes like rudeness, stubbornness, gangsterism, and cultism etc which are capable of disturbing academic progress . There are legitimate associations to which a normal student should belong; you are advised not to engage in any shoddy associations or activities”, he added. 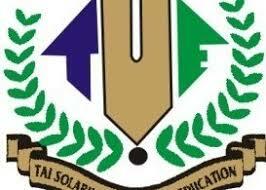 “The development of Tai Solarin University of Education curricular also consist of Vocational Training for our undergraduates so as to relieve them of the burden of unemployment but rather to be self-sustaining and employers of labour. Therefore, each student is expected to make use of this opportunity to equally equip themselves with vocational skills apart from the Degree Certificate which they would have at the end of their programme” he said.